What’s an alpaca? What do you do with them? How is yarn made? 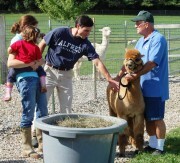 Find out the answers to these questions and many more at the Alpaca Farm & Fiber Mill Fall Open House. Located in Brandon, VT, Maple View Farm Alpacas and the Vermont Fiber Mill & Studio will be open to visitors from 11 a.m. – 4 p.m. on Saturday, September 19 and Sunday, Septamber 20. Join us for a fun weekend on the farm! Visitors will be greeted by over 25 alpacas including cria (babies) born recently, who will entertain you as they romp and play. The unique capabilities of the FeltLOOM will be demonstrated and the fiber mill can be viewed in action. Ed and Debbie Bratton have been raising alpacas for 10 years at their 100 acre farm in Brandon. Alpacas are a domesticated species of the South American Camelid, raised for the fine, warm, hypoallergenic fiber they produce. Alpaca fiber, which comes in 22 natural colors, is used to make knitted and woven items, similar to wool. The Brattons opened a newly built fiber mill and studio on the farm in 2012. The mill offers custom processing of fiber into high quality batts, roving, yarn and felt. For more information, visit the website at www.mapleviewfarmalpacas.com or Facebook at Maple View Farm Alpacas and Vermont Fiber Mill & Studio. The farm is located at 185 Adams Rd, Brandon, VT. Contact or 802.247.5412 for more information.